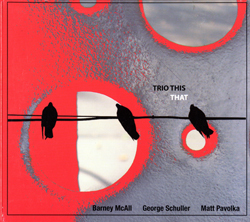 Barney McAll, piano & chucky; Matt Pavolka, bass; George Schuller, drums & bells. The Jazz Piano Trio has long been the preferred format for many of our greatest pianists…first established by the likes of Earl Hines, Teddy Wilson, Bud Powell, Thelonious Monk, Oscar Peterson, Wynton Kelly, Red Garland, Bill Evans and continued to this day by such sonic mavericks as Herbie Hancock, Keith Jarrett, Hank Jones, Cecil Taylor, and Brad Melhdau, among many others. Co-leaders Barney McAll & George Schuller follow this rich tradition only as a launching pad for new ideas and pathways yet undiscovered. Joined by bassist Matt Pavolka, Trio This will keep one eye planted on history while the other searches for the nearest exit. GM Recordings is proud to announce an exciting new recording from Trio This entitled That (GM3050CD) to be released this December 2009. This is a collaborative project between Schuller and McAll, their first trio recording featuring originals from both composers as well as thoughtful re-examinations of works by Wayne Shorter, Henry Mancini, Les McCann as well as a rare English hymn by Geoffrey Shaw.